Congratulations to the producers of this movie who have dared to make a commercially viable product out of one of the world’s most shameful and under-acknowledged events. The event in question was the attempt by the Ottoman Muslim caliphate in 1915 to exterminate the Armenian population within their borders. If we’re being pedantic, it was not a “genocide” (the word only entered our language in 1943) but it was surely an attempt at race extermination, with 1.5 million Armenians killed during and just after World War One. This terrible event not only included mass murder, but the erasure of all traces of Armenian life, from the destruction of their churches and libraries and institutes to the crude altering of official Turkish maps and schoolbooks in an attempt to deny that there had ever been an Armenia in the first place. It would be laughable, if it weren’t so serious, that respective Turkish governments continue to deny that it happened. It has to be said that The Promise is by no means a definitive account of this Armenian holocaust. It is, rather, a vividly filmed adventure story with a strong romantic element that uses the Armenian conflict as its context. The importance of the film is that it attempts to introduce the subject to a mass audience. Hopefully, more – and better – movies on this subject will now be made. 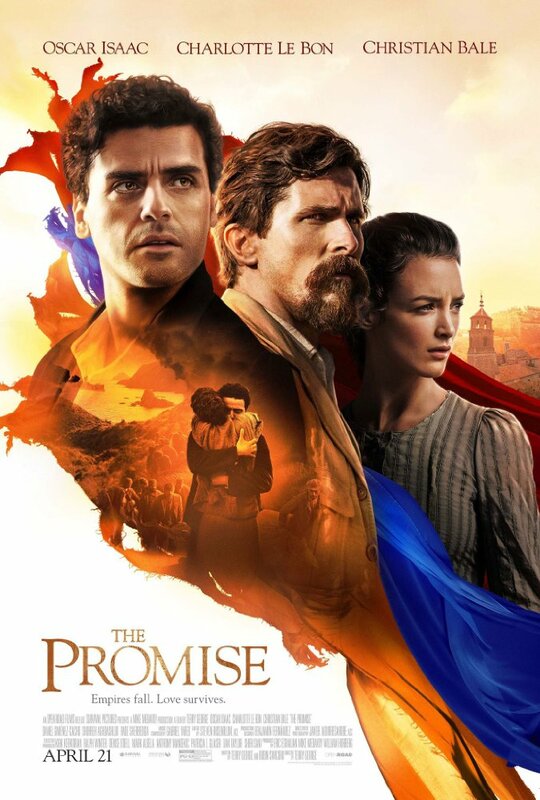 The Promise makes no bones about its intentions: it was funded by the (Armenian) Kerkorian Foundation based in the US, and produced by an Armenian-American company. It is also directed by Irishman Terry George who is no stranger to the subject of genocide, having made the Oscar-nominated Hotel Rwanda. But rather than appeal to specialists, George has looked to create an entertainment that appeals to a mass audience that has little or no knowledge of Armenia. The scale is enormous, with the movie drenched in expensive production values with some spectacular sunsets, battle scenes and mountainous vistas. The inspiration is clearly movies like Dr Zhivago and Lawrence of Arabia, albeit that The Promise is inferior to both. If the location shooting is impressive, the human drama is less so although the movie benefits from a convincing performance from Oscar Isaac who stars as an Armenian student, Michael, studying to be a doctor in a seething Constantinople on the brink of war. Michael has promised to marry a girl back in his village, and her dowry has enabled him to pursue his studies. Meanwhile, he meets a beautiful Armenian artist, Ana (Charlotte le Bon), who has been educated in Paris, and her drunken boyfriend, Associated Press reporter Chris (Christian Bale). As war approaches, and Ottoman hostility towards local Armenians becomes more focused, so this romantic triangle starts to hum. The movie is far from perfect. The causes of the genocide are not pursued in any detail, some of the dialogue is stiff and the action wooden while the action is punctuated by a number of tear-stained partings and sobbing reunions that may not impress the filmically austere. Still, even if the movie is second-rate David Lean, it’s a crowd-pleaser and it may just get you thinking about a largely unknown event that desperately needs an airing.